Almost all Coffee Planters, worldwide are of the opinion that Bees and butterflies are the only agents of pollination of coffee and other mixed crops associated with coffee. This is not true. There are many other agents of pollination closely associated with coffee forests. Pollinators come in all shapes and sizes and includes birds, insects and mammals. Research data indicates that more than 100,000 different kinds of animals, pollinate over 250,000 different kinds of plants. It is interesting to note that pollinators, irrespective of the group they belong to are often adapted to pollinate specific plants. 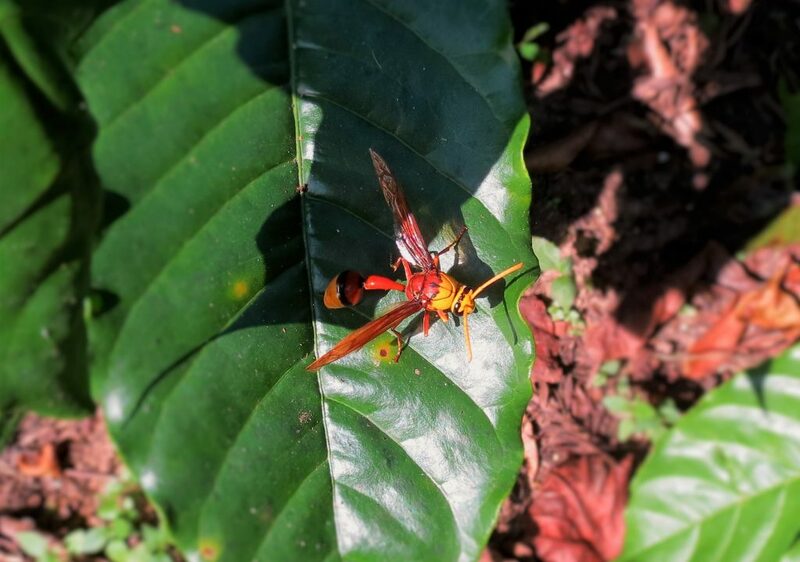 It is for this very reason, it is very important to protect all kinds of biodiversity within the Coffee Ecosystem. It is a fact that three-fourths of the world’s flowering plants and almost all food crops depend on animal pollinators to reproduce. Bees and butterflies constitute a major part of pollination. Apart from Honeybees and butterflies, there are many other species of insects like ants, wasps, moths, flies, dragonflies, damselflies, grasshoppers, Beetles, bats, humming birds and other animals that play an important role in pollination and fruit set in coffee. Pollinators are economically, socially and culturally important. Readers, worldwide need to understand that India’s shade grown eco-friendly coffee forests are unique when compared with other coffee producing Nations, because they are grown under the canopy of a three-tiered shade system which includes a heterogeneous tree population comprising of native and introduced trees, herbs, shrubs, flowering plants, fruits, spices and other mixed crops. In short, the coffee ecosystem provides an ideal environment for all pollinators because of the accessibility to flowers all year round. Flowering can be observed either from trees, herbs, shrubs, weeds, or fruit plants or spices. In some varieties, flowering is staggered thereby providing a continuous source of pollen and nectar. The diverse coffee ecosystem has many symbiotic roles to play with the surrounding biotic community. Especially, when it comes to the flowering morphology of various trees, fruit crops, herbs, spices and other plants, we notice an interdependency of certain species of native insect pollinators with their corresponding host plants. Most plants have a definite flower morphology, colour, blooming sequence, characteristic scent pattern that will attract a particular type of pollinator to meet its protein requirement. In some species this symbiotic relationship between plant and pollinator has evolved over thousands of years and is so interconnected that the absence of one can signal the extinction of the other. Hence, it is important to understand that all flora and fauna inside coffee forests have a role to play in the productivity of the ecosystem. Maintaining a healthy population of pollinators is a pre requisite for reproduction and maintenance of genetic diversity inside coffee forests. The Coffee Community in India has always been proactive in terms of conservation of biodiversity. In recent years, due to price drop in coffee and allied crops and also due to global warming, biodiversity loss has alarmingly increased. This impact has significantly impacted many species of beneficial insects, especially the pollinators. We have not come across any scientific study on the agents involved in the pollination of coffee and other mixed crops apart from honey bees and butterflies. 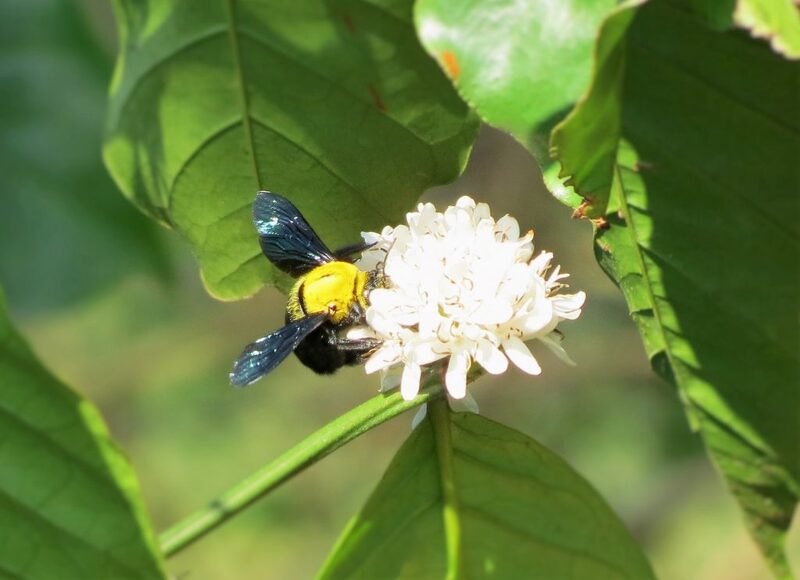 We record a few observations of pollination by insects and are of the view that due to a significant reduction in population of honey bees and butterflies, Planters should take note of other agents which are also equally important in facilitating pollination inside coffee forests. All kinds of pollinating agents have very high-energy needs that must be met for their survival. Key resources such as pollen and nectar are met from a variety of flowers that bloom throughout the season. Each type of pollinator requires a specific habitat. 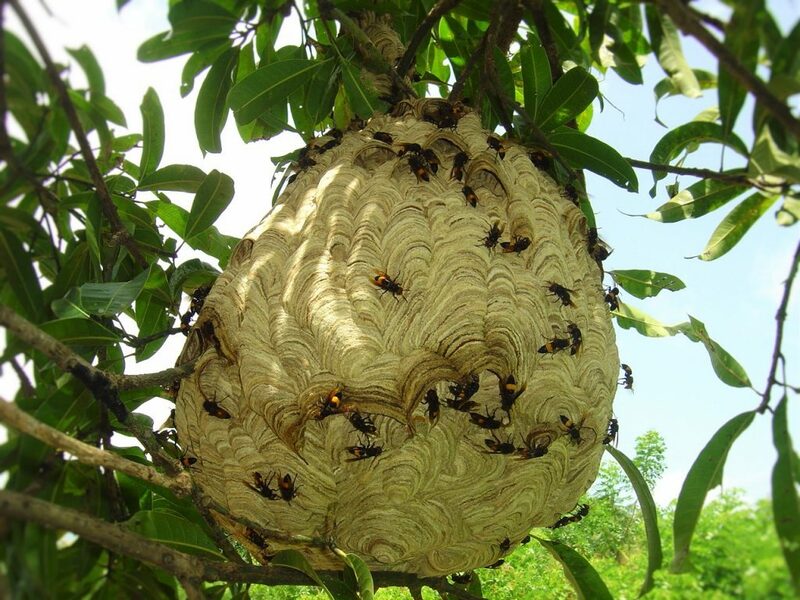 Bees and wasps require nest sites, Beetles, butterflies, moths, flies and some wasps require larval feeding sites, others require hunting sites and over wintering sites. The selection of sites is based on areas where the natural enemies or predator population is low. 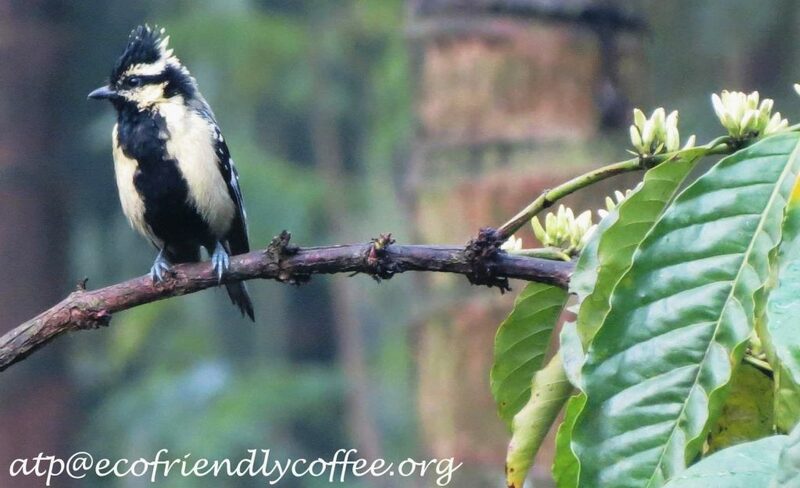 Coffee farmers need to protect these sites to support the pollinator populations. Entomophily – pollination by insect. Scientific evidence points out to the fact that dragonflies and damselflies may rest on flowers, but don’t carry enough pollen from flower to flower to be considered pollinators. 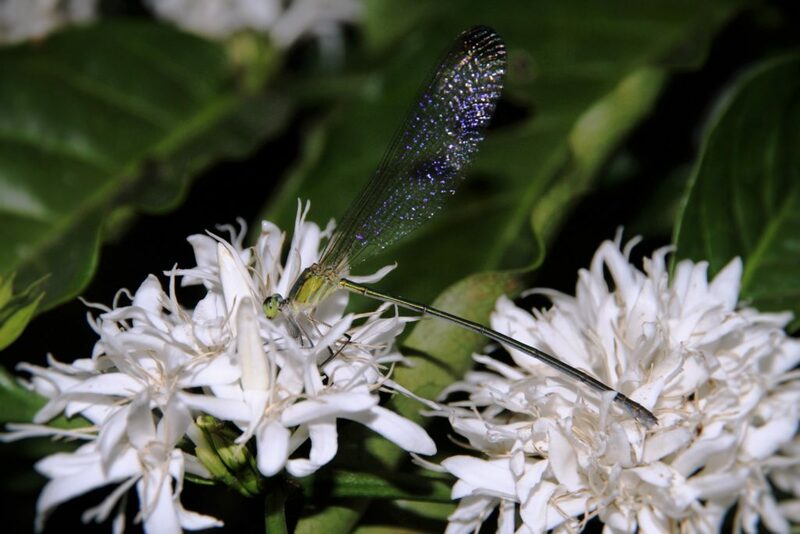 We are of a different opinion because our observations point out that damselflies repeatedly fly from one coffee flower to the other and may play an important role in pollination. However with respect to dragonflies, we have not observed such frequent activity. We have observed different species of ants, Black and red in colour visiting coffee flowers during blossom to collect energy rich nectar. However, we are not sure as to how effective the various species of ants are in helping with pollination. The coffee forests are gifted with many bat species. Some are tiny in size and the others huge with a long wing span. They are often referred to as the night shift pollinators. 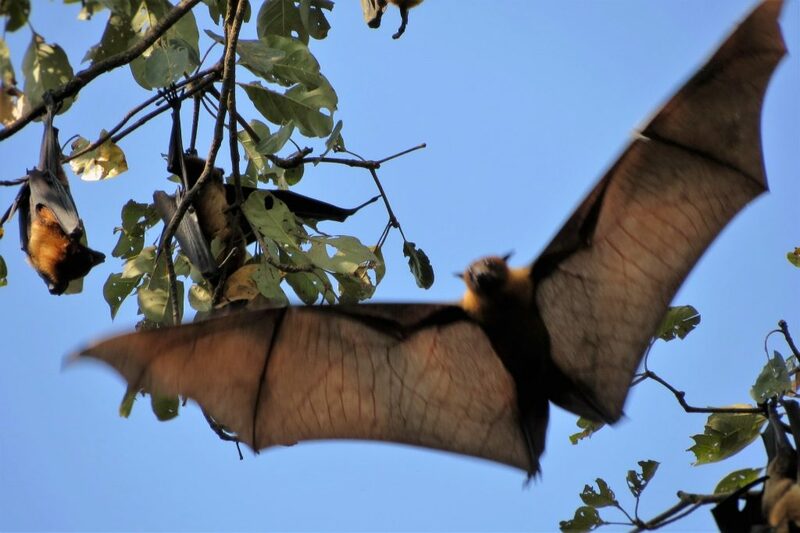 Research data clearly shows that over 300 species of fruit depend on bats for pollination which also includes mangoes, guvas, sapotas, bananas, and figs. 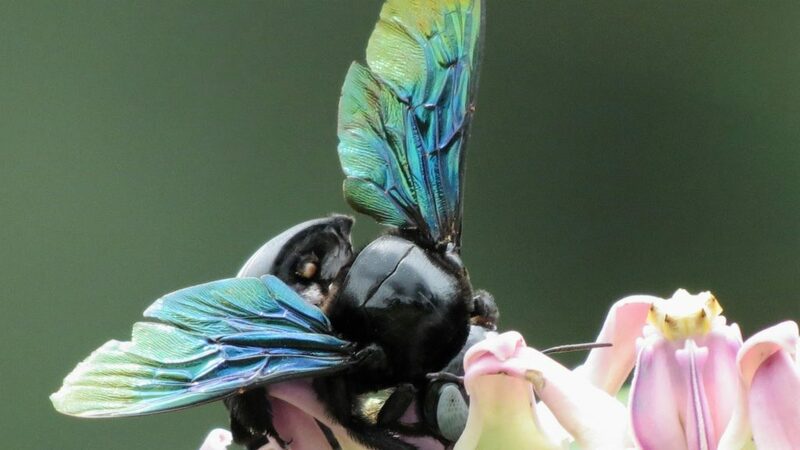 Cantharophily – pollination by beetle. 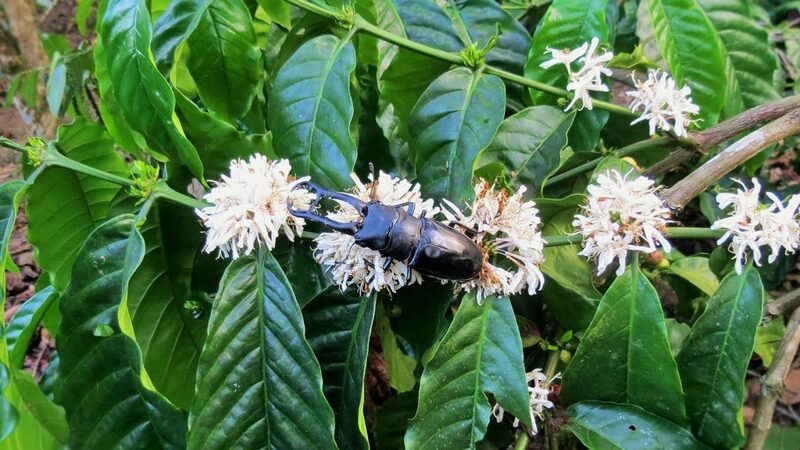 We have observed many beetle species involved in coffee and mixed crop pollination. Beetles comprise the largest set of pollinating animals, due to sheer numbers. They are responsible for pollinating 88% of the 240,000 flowering plants globally. Scents associated with beetle pollination are often spicy (Crab apples), sweet (Chimonananthus), or fermented (Calycanthus). 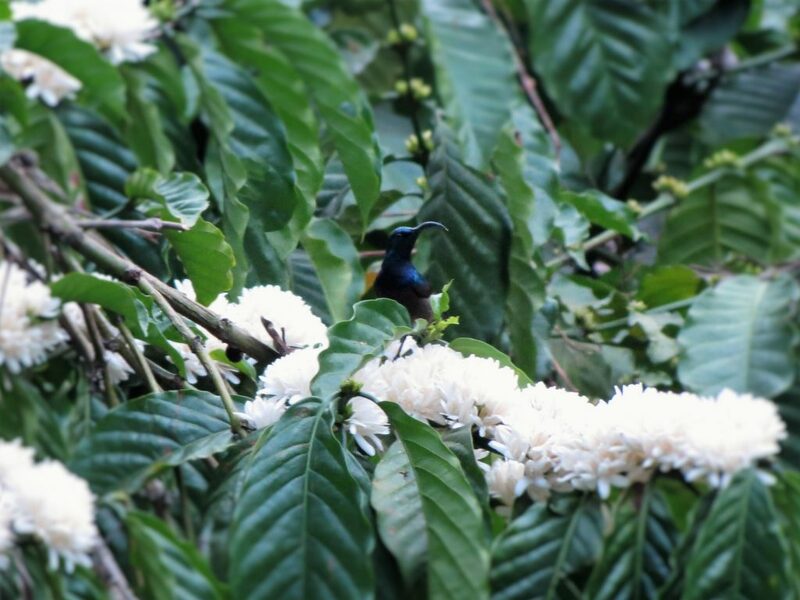 Our scientific study on coffee forests has shown that over 100 species of birds habit the coffee ecosystem. Some are resident and others migratory in nature. 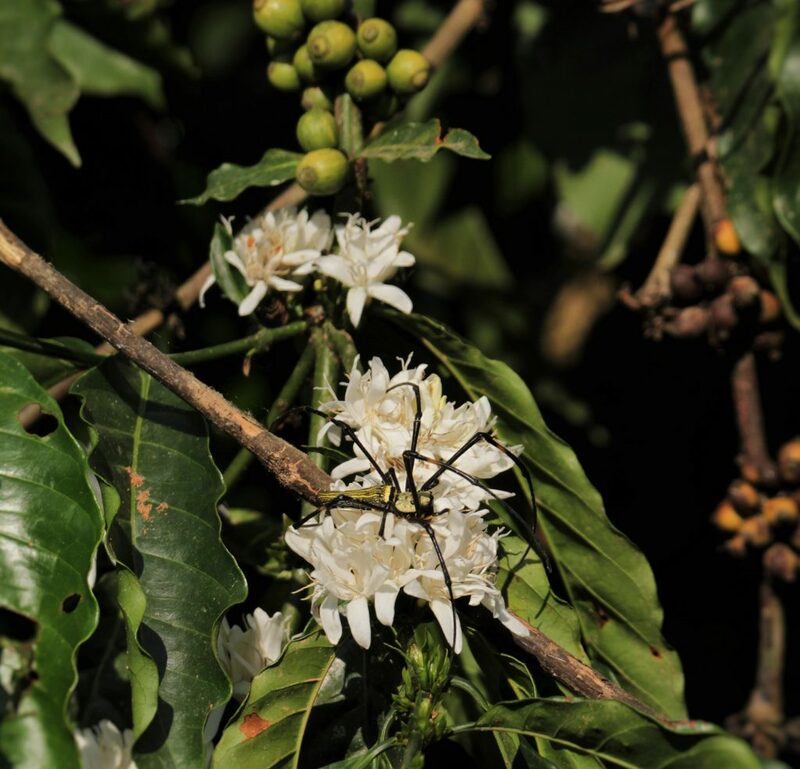 However, during the coffee blossom, we have noticed only a handful of species directly involved in coffee pollination. A majority of them are the humming birds. We are still studying and documenting the birds involved in pollination of coffee and allied crops like areca and oil palm. 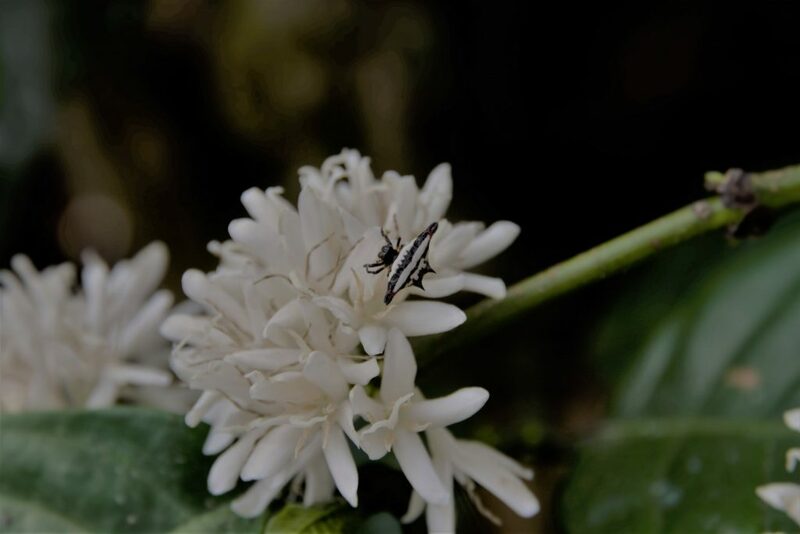 We have observed a few types of flies during coffee flowering but have yet to ascertain their role in pollination. However, scientific evidence points out that flies even though are not as hairy as bees and as efficient in carrying pollen, but some are good pollinators. 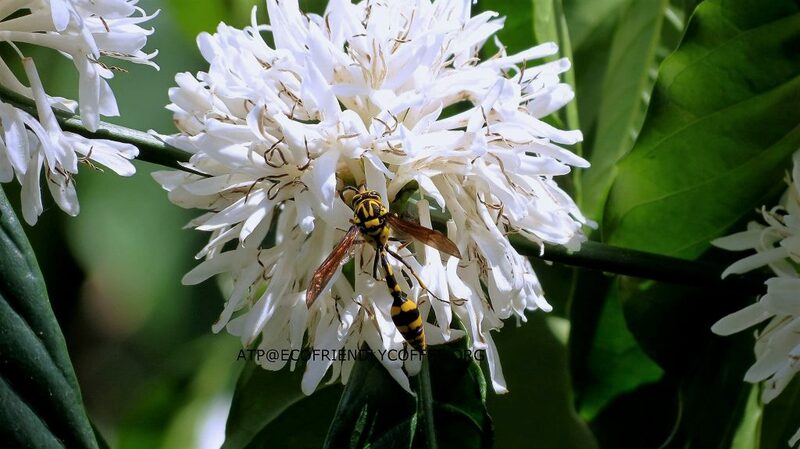 The Coffee ecosystem is gifted with many different species of wasps and all the species are excellent pollinators. Melittophily or hymenopterophily – pollination by bumblebee. 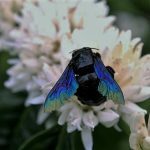 The population of bumble bees, especially during coffee flowering is significantly higher when compared to other seasons. 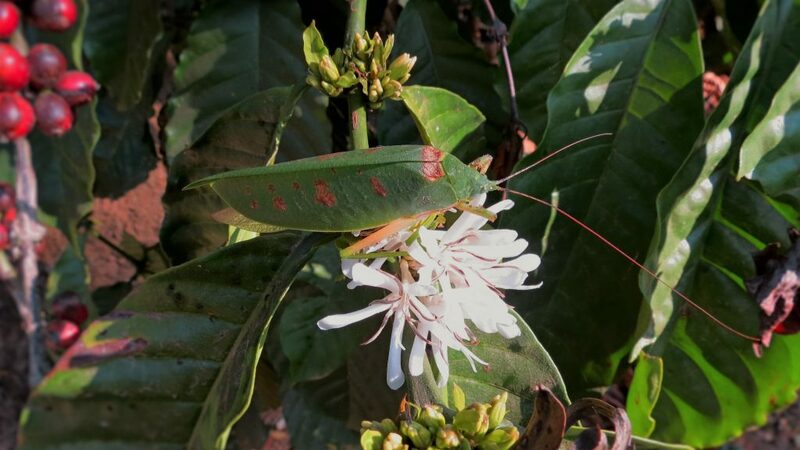 This may throw light on the important role they play in pollination of coffee. We have noticed a high level of activity of different species of spiders during blossom and are not sure if they are directly involved in pollination. Why are pollinators at risk? Air and water pollution due to indiscriminate use of fertilizers and pesticides. Habitat loss and fragmentation of forests. Widespread disease and pest incidence due to the impact of global warming. First and foremost use Integrated Pest management practices that reduce the dependency on chemical control of pests. Add to the diversity of the farm. In a way provide for multiple crops (farm site). Provide flowering plants (garden) where flowers should be available throughout the entire growing season. These plants should provide overlapping blooming times so that flowers are available to provide pollen and nectar throughout the season. It is desirable to include a variety of plants with different flower colours, sizes and shapes as well as varying plant heights and growth habits to encourage the maximum numbers and diversity of pollinators. Next to oil, coffee is the largest traded commodity and employs 25 million unskilled workers in almost 80 coffee producing Countries. Coffee represents an important source of income for marginal farmers in most developing Countries. However, a recent report brought out by the Food and Agriculture Organization of the United Nations clearly states that Pollinators vital to our food supply are under threat, threatening millions of livelihoods and hundreds of billions of dollars’ worth of food supplies. The Millennium Ecosystem Assessment concluded that with the global decline in the amount of pollinators, there is not a complete loss of fruit or seeds, but a significant decrease in quantity and viability in fruits, and a lower number of seeds. Janet Marinelli, Editor in Chief, 2005. Flowering Plants, Pollinators, and the Health of the Planet. First American Edition. Dorling Kindersley Limited (DK Publishing, Inc.). New York. 512 Pages.